The new conservative majority on the US Supreme Court is weighing in on some of the most important issues of our time, and yesterday's 5-4 ruling in favor of the Trump administration is just a sampling of what is expected to come. June 30, 2016: The Obama administration ends the ban on military service by transgender individuals. "No otherwise qualified Service member may be involuntarily separated, discharged or denied reenlistment or continuation of service, solely on the basis of their gender identity. 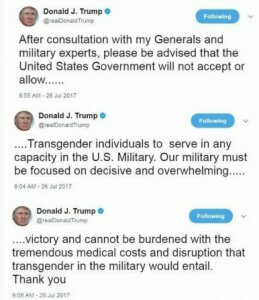 July 26, 2017: To the surprise of our country's military leaders, President Donald Trump tweeted that the US Government would not allow transgender individuals to serve "in any capacity in the U.S. Military." August 1, 2017: The Palm Center released a letter signed by 56 retired generals and admirals, opposing the proposed ban on transgender military service members. August 25, 2017: Donald Trump issued a Presidential Memorandum on Military Service by Transgender Individuals reinstating the ban on transgender personnel in the military, and calling for the Secretary of Defense and Secretary of Homeland Security to submit an implementation plan by February 21, 2018. September 18, 2017: Secretary of Defense James Mattis issued formal guidance freezing the Obama administration's lift on the ban. Current transgender soldiers, however, would not be denied reenlistment, and could not be involuntarily discharged solely on the basis of their gender identity. August-September, 2017: Four separate law suits were filed against the administraton by GLAD & NCLR, the ACLU of Maryland, Lambda Legal and Equality California -- resulting in preliminary injunctions against implementation of the Presidential Memorandum. 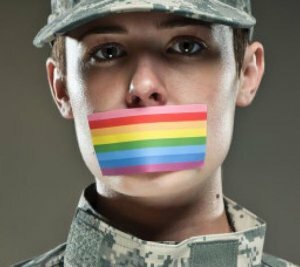 September-October, 2017: bipartisan bills were introduced in the Senate (S.1820) and House (H.R.4041) to prohibit the involuntary separation or denial of re-enlistment of military personnel solely on the basis of gender identity. The Senate bill, although co-sponsored by the late Senator John McCain (R-AZ), did not make it out of the Republican-controlled Armed Services Committee. December, 2017: The US Department of Justice (DOJ) filed for emergency stays on the injunctions against the ban, which were denied. January 1, 2018: The Pentagon was forced to allow transgender applicants to join the military. March 23, 2018: Donald Trump issued a Presidential Memorandum for the Secretary of Defense and the Secretary of Homeland Security Regarding Military Service by Transgender Individuals. "Transgender persons with a history or diagnosis of gender dysphoria -- individuals who the policies state may require substantial medical treatment, including medications and surgery -- are disqualified from military service except under certain limited circumstances." The admnistration argued that the new memorandum revoked the prior memo of August 25, 2017 and authorized Defense Secretary Mattis and Homeland Security Secretary Kirsten Nielsen to "implement any appropriate policies concerning military service by transgender individuals". Based on the new memorandum, DOJ filed motions to dissolve the preliminary injunctions previously imposed on Trump's August 25, 2017 memorandum. November 23, 2018: The Trump administration, through Solicitor General Noel Francisco, submitted petitions of writ of certiorari to the US Supreme Court to rule on the matter of the 2017 lawsuits prior to their final judgement -- specifically seeking to reverse the stays while the cases continued in their respective courts. January 22, 2019: In a 5-4 order split along ideological lines, the Supreme Court of the United States (SCOTUS) allowed the Trump administration's policy to be enacted while the lower courts continued to deliberate on the merits of the cases. However, because SCOTUS' decision lifted two of the three injunctions, Pentagon officials said they cannot completely implement the new policy yet. The government did not appeal a third injunction to SCOTUS because it is still pending in district court, but the Supreme Court's decision to grant the two injunctions is expected to prompt a similar stay by the lower court. The SCOTUS decision was made without comment, but their ruling is an indication of what may be expected if, or when, the cases come before them again. An estimated 14,700 transgender troops currently serve in the US military. 18 other countries allow transgender people to serve.